Sett seil over Middelhavet for et naturskjønt 40-minutters cruise og beundre Barcelonas skyline fra havet. 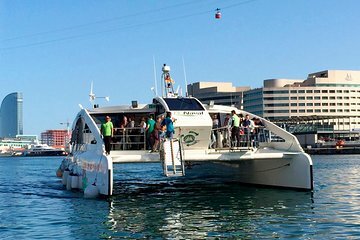 Hopp ombord på en miljøvennlig katamaran og gli forbi de glitrende yachter i Port Vell, se byens landemerker som Columbus-monumentet og cruise langs sandstrendene på Barceloneta-stranden. Nice to get on water. They started late. Said it was the last sailing but it wasn't. No one was around to buy drinks, snacks, etc. The tour was short and sweet with no narrative about what you were seeing or historical information. The boat arrived late at the dock by 10 min and returned us 5 min early so they would be on time for the next cruise. They had no change for the snack/beverage bar and had to stand around until another customer could pay and they had change to give me. I understand it was a very inexpensive tour however other than a break from the Barcelona heat it was not worth the time and effort to walk to the Port. Not like other Catamaran cruises I have been on. Felt more like a slow ferry ride, was a let down. Great experience for the money. Could have used better directions to get to the boat. Great experience! Checked into our hotel after a long day of travel and headed to the port for what ended up being a beautiful cruise of the port and surrounding area. Gorgeous views, excellent photo taking opportunities, and smooth sailing all around. Perfect way to relax and take a break from your holiday and see some of the most fantastic views of Barcelona. Highly recommended! Toll und empfehlenswert für einen kurzen Blick auf die Skyline von Barcelona. Wer mehr erwartet wird enttäuscht, da es eine kurze Fahrt ist, und nicht spektakulär ist. Sind sehr zufrieden für die Länge der Fahrt und natürlich der Preis. Many excursions say they are 'easy' and turn out to be a little more work than intended. THIS excursion is EASY and cheap and worth the 40 min of relaxation out of anyone's day/evening. I wish I had known in advance of the possibility to book an outing with the Flamenco dancers on board. That would also be worth the price of a ticket as well. No matter when you go, it's worth the time and money.